Some people might express concern about this large lure and its"mobile center of gravity" function: the body size is too large, the underwater action might be exaggerated, the rattles could be too loud, and so on. But in fact there is no need to worry: M's innovative design minimizes all these elements effectively and it has mastered the basic functions of a minnow, so the M could be described as the "Super Basic Minnow." 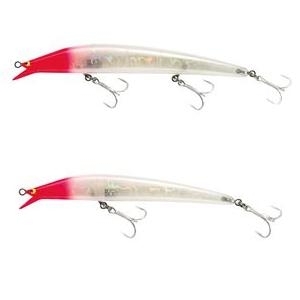 M is a lure with no particular limits regarding targets, areas or techniques: it is the minnow to meet your needs on any occasion.